Apart from its ultimate-long term goal to develop and distribute complete Point-of-Care devices, the company develops data acquisition and control systems for integration into medical and molecular diagnostics instruments. by researchers for developing new experimental set-ups. Define the protocol (assay) of the experiments. That is the steps which should be performed to execute a microfluidic experiment by controlling the actuators (syring pums, stepper motors etc) based on data received from the sensing elements (temperature, liquid position etc). Monitor the progress and the outcomes (results) of the experiment. These results are based on the data values received from the biosensors of the system after an appropriate electrical signal analysis which target specific characteristics e.g. 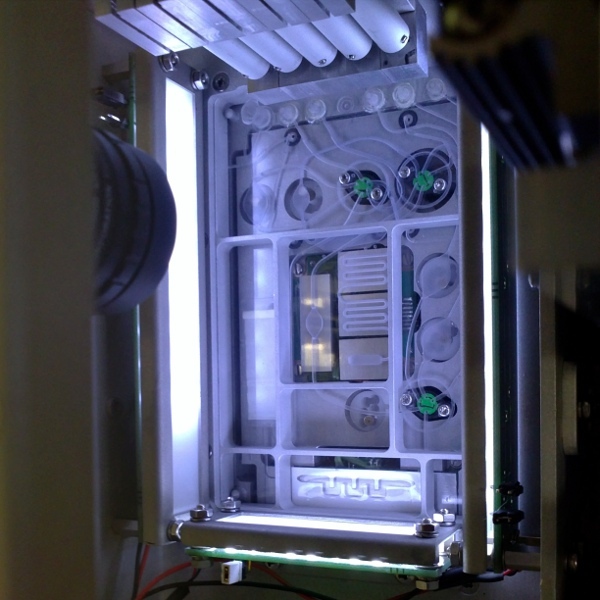 the hybridization of biosensors in genetic analysies. To control at real-time the progress of the experiment: start, abort, pause etc. Attach arbitrary actuators and sensing elements on the instrument and define their electrical protocol and software control programs. 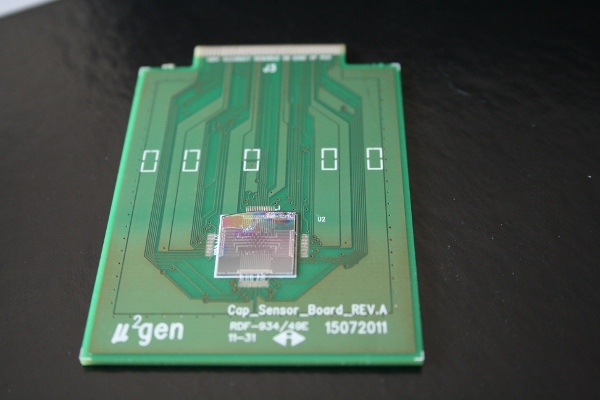 Define and process the geometry and characteristics of new microfluidic chips to enable the utilization of companies patented machine vision technology to automatically control the movement of liquids in the chip. 2. Real-time controller board (control of the experiment). 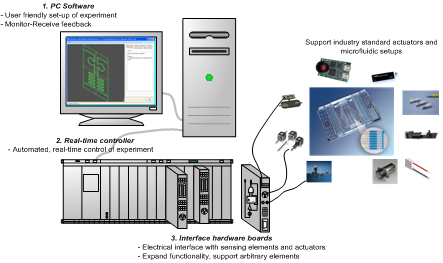 This subsystem monitors and controls at real-time the operation of the actuators and sensing elements of the system based on the protocol of the experiment defined by the PC Software. 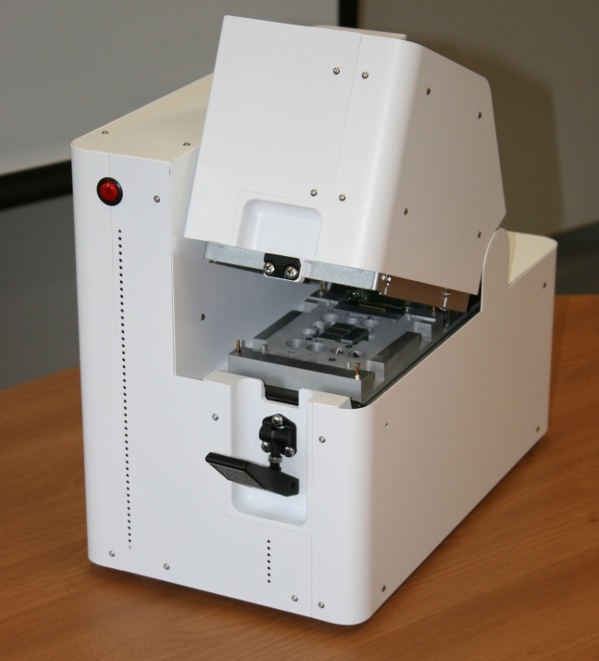 This subsystem includes the machine vision module. 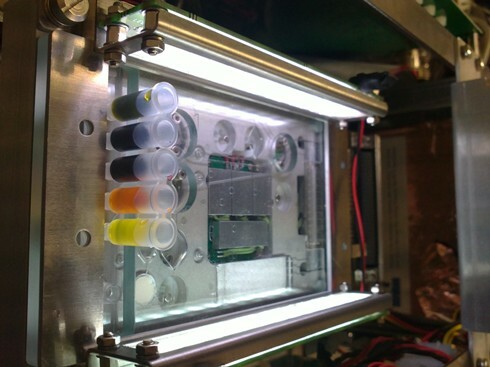 The module monitors the progress of the experiment by sensing the liquids position, their speed and volume and informs the real-time control subsystem, creating this way a closed-control loop. 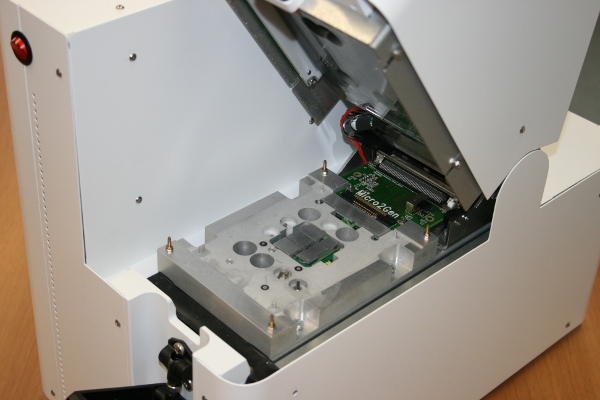 The exploitation of machine vision for controlling the microfluidic experiment is an innovative technique for which the company has already filed a patent. 3. 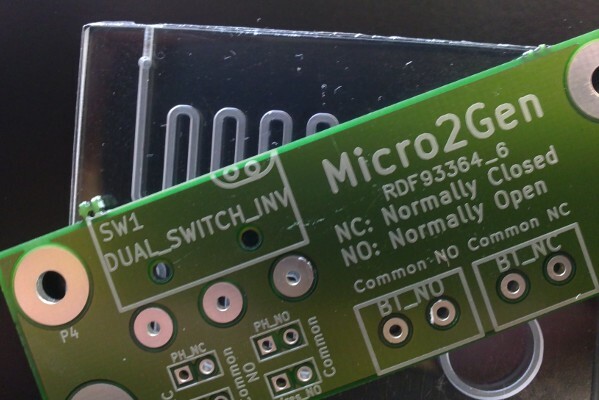 Interface hardware boards. The system support a modular expansion of its functionality by plugin various electrical interfaces with sensing elements and actuators, based on the customer specific needs. The company will develop and distribute several interface hardware boards covering the majority of the application domain. The user can select the appropriate for his/her application boards and even purchase additional in the future to support additional applications. In addition the company will offer services for designing customized interface hardware boards for the customer’s needs.